100 • RV PRO • September 2018 rv-pro.com D E A L E R S New Store, New Opportunities At the New Hampshire dealership, which started selling RVs in June, an 8,500-square-foot building with five service bays sits on 10 acres. The location has 11 employees so far, three of whom are service technicians. In conversation, Gregoire returns often to the dealership's guiding principle of "excellent service before and after the sale." As an example of that emphasis on customer service, Gregoire says Vermont Country Campers has made the six-hour drive — each way — to Long Island, N.Y., to provide roadside ser- vice to a customer. Why not have another dealer closer at hand take care of the problem? "They were our customers, and we like to take care of our own," Gregoire says. "We're looking for them to have an excellent experience, both during the sale and after," he says of customers. "If they have a good experience, they're going to send their friends, they're going to send their family members. Another aspect of the company's "customer-first" philosophy is a commitment to sell only quality campers, he says. "We do not put anything on our lot that we ourselves would not camp in," he says. "That's really important. That's part of our inventory philosophy." The philosophy has earned the dealership strong customer loyalty. 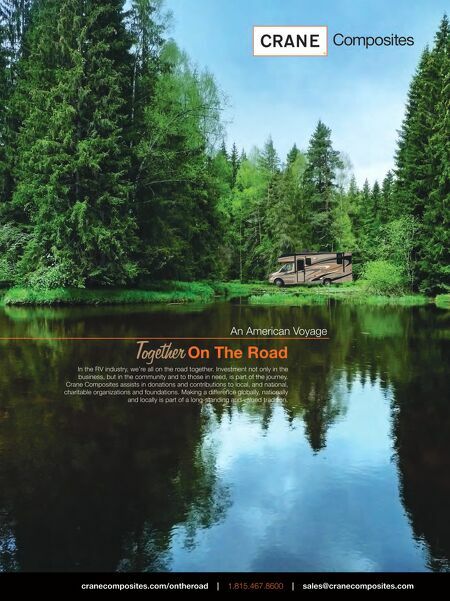 "We have one customer who has bought 20 campers from us in our almost 23 years in business," Gregoire says. "I have a number of customers who have bought from us more than four or five times. All in the Family Layne Gregoire wanted to share his business experience with his son and daughter as they grew up, according to Logan Gregoire. "My dad and I, since I can remember, have always talked about business, and Vermont Country Campers in particular," he says. "The very first sale I was a part of, I was 10 years old, and we sold a fifth wheel to a lady. She gave me $10 for helping out – my first commission." Along with that family involvement in business matters, the Gregoires also went camping together, which helped them better understand the issues their customers faced. "My first camping memories were actually in a pop-up," Gregoire recalls. "My dad made sure to take us camping so we could experience the outdoors, break away as a family. "It was so important that as a family we understood what our customers were going through," he adds. "A big part of us understanding that service element was us getting out camping." Doug Clark (left) and Connor Fowler confer on a sale in the foreground, while other sales associates work at their desks in the background. The dealership has had great success in attracting customers beyond its local market.